Baby squirrels don't resemble their furry, bushy-tailed parents. They are born pink, hairless, deaf and blind, weighing about a half-ounce. Squirrel litters are relatively small for rodents, rarely exceeding four kits and often just one or two. 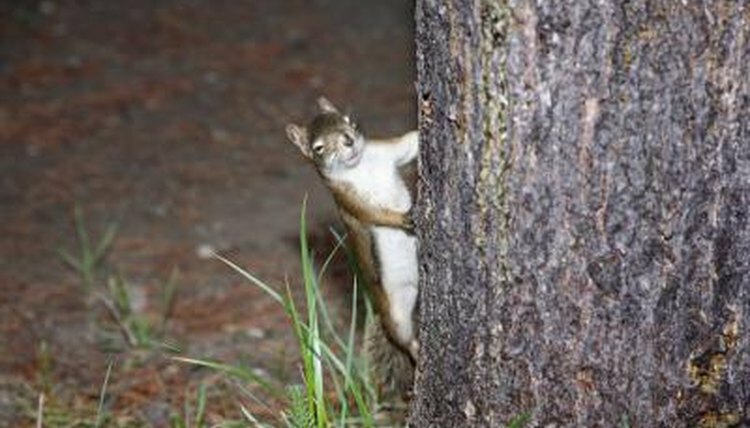 Depending on the species, female squirrels usually give birth to two litters annually, in the late winter and mid-summer. Baby squirrels can hear quite a while before they can see. By the age of 3 weeks, their ears open, followed by the eyes two weeks later. Before the hair starts growing in, the skin begins to darken. About the age of 3 weeks, the first fuzzy hairs appear. Hair starts sprouting on the tail around 4 weeks. By the next week, the tail starts spreading out. By the age of 7 weeks, the baby squirrel's body and tail hair has grown in and he looks like a miniature adult. Baby squirrels stay in the nest for the first 10 to 12 weeks of their lives. Squirrels born in the winter are usually independent by the age of 4 months, starting out in the warmth and abundance of spring. Summer-born kits might stay within the family unit longer, until reaching the age of 6 months. What Types of Squirrels Are in Illinois? How Does a Mother Koala Carry Her Baby? Can Squirrels Survive Cold Nights?